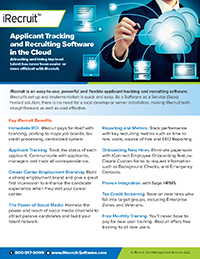 Brian Kelly tells HR.com How iRecruit Is An Affordable ATS with Easy Integration and He Loves WOTC! Brian Kelly, Managing Partner of CMS iRecruit, explains to Sue Morton of HR.com Live, how iRecruit’s unique applicant tracking software facilitates seamless integration AND taps into additional talent pools that give tax service credits using WOTC. In the interview Brian explains to Sue what makes iRecruit different from other ATS systems and how iRecruit provides a unique experience. This entry was posted in Blog, iRecruit Blog and tagged ats, Brian Kelly, hr.com, interview, iRecruit, wotc. Bookmark the permalink.